This two-layer cake was covered in white fondant then each layer was inverted. Starting with the white, which would eventually be the top, I ruffled strips of fondant by rubbing the long edge with the ball tip tool on a foam square and gum pasted them on the cake. This is tedious work because I had to be careful not to tear the fondant by going to thin. 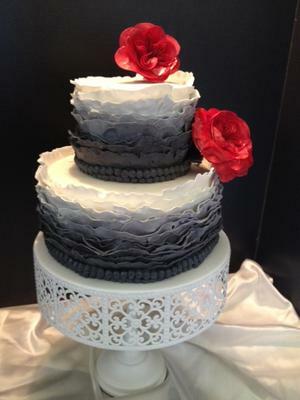 With each layer going up I added a bit more black fondant to the white to achieve the ombre' look. Every shade has three layers except the white. Only two of those! There was a total of 14 layers on each cake. (with good supports...it's rather heavy!) and finished them off with 2 rows of "beads" and the English cabbage roses. The order was for red flowers, which is tricky. No matter how much gel color I add it always looks a bit more dark pink that red. The fondant was red, but I finished them off by spraying them with the air brush. It gave them a very nice shine. I had planned on spraying the whole cake with pearl, but I like the look of the matte finish on the ruffle. It accented the roses nicely! It was fun and since I posted it on Facebook I have gotten 2 orders! The stunning detail work of the ruffles as well as the graduating colors were great. Thanks for sharing. Excellent job! Very Pretty!! Christy is going to have a difficult time deciding the winner this month!! Your cake is beautiful & a great discription besides! !